Several times each year (but particularly post-Christmas and New Year) we’re taken by surprise by our reflection in the mirror, pricked by our conscience, or pulled up by a health issue and seduced by clever marketing into digging deep to shell out our cash in pursuit of the Holy Grail: A cleaner, leaner, healthier and more attractive you! And who doesn’t want to look and feel better, leaner and more attractive? 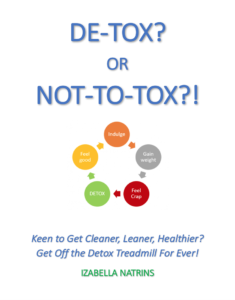 More than 25 pages of Google search results promising products, services and regimens for ‘detox’ and ‘cleanses’ are testament to the fact that detox is BIG business. 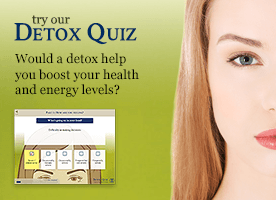 But whether the detox industry actually delivers ‘detox’, how efficiently and for how long, is the question. Short-term results (particularly weight-loss) can be achieved on a detox ‘plan’ since, whatever else we do, we restrict calories and eliminate processed and junk foods, , for example, by restricting or eliminating carbohydrates (bread, pasta, potatoes and other starchy veggies), sugars (refined, natural and fruit juices), healthy saturated fats and red meat. Next, we introduce a regime of plant-based green juices, green leaves, super-foods and, of course a cocktail of supplements. 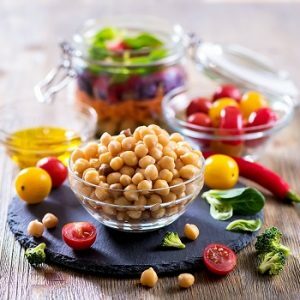 However, while these kinds of protocols are appealing, they lack the necessary and sufficient range of macronutrients and bioavailable micronutrients to fuel the body to meet its energy needs. Fearing famine, the body slows down metabolism to conserve energy, releases the stress hormone cortisol and starts to break down muscle in a very inefficient process of converting protein to glucose, in an attempt make good the energy deficit. While fat stores and muscle mass (and thus weight) may be lost, the body is not only under-powered, but it’s undernourished too leaving its elegant in-built, detoxification unable to work effectively. The liver, kidneys, skin and lungs are key organs for natural detoxification. In a nutshell, the liver is primary in this process, acting like a dynamic ‘filter’ for the blood which continuously passes through it. The liver scans for, transforms and takes out potentially harmful substances before they can reach toxic levels and makes them ‘water-soluble,’ to enable their excretion through the skin in sweat, or through the kidneys in urine. In a healthy, well-nourished body with an efficient metabolism, the liver is continuously discarding toxic ‘trash’ before it can build up. A ‘detox’ or a ‘cleanse’ will remove some of the trash by eliminating highly processed foods and refined vegetable and seed cooking oils – at least for a week or two and allow our liver to work much more efficiently. But, removing the fat-soluble toxins stored in the body is not a simple matter of a few days of juicing, consuming a ‘clean’ liquid diet, or severely restricting our food intake. In fact, a ‘clean’ detox regime or diet risks starving the liver of the essential proteins, vitamins and minerals it needs to perform its function properly – leaving an overload of highly reactive toxins, created during the detoxification process itself, circulating in our system. These concentrated toxins promote inflammation, gut dysbiosis, intestinal permeability and chronic health problems. To support the liver to detox the body naturally, we need to nourish it with specific nutrients at various stages of the chemical detoxification process, not forgetting the role that high-quality filter water plays in the process of helping to flush toxins out of the body. Traditional, nutrient dense foods contain exactly the right balance of these nutrients. These foods include eggs, milk, cheese, broths, meats, organ meats and saturated fats from grass-fed animals raised on unsprayed pasture and organic feed; coconut oil, olive oil, wild-caught fish; a wide variety of organic vegetables of every colour (both cooked and raw); fermented foods; whole unprocessed organic grains. Is it surprising that these are the very foods that kept generations of our ancestors healthy? Food is medicine and our quickest win, but it’s not our only medicine. Our body is much more than a set of isolated biological processes; it’s a context-dependent system of systems which work together to support optimum health. A ‘toxic lifestyle’ will impact our body in myriad ways – directly and indirectly, poor sleep, chronic stress, lack of movement, social isolation and environmental toxins (particularly those in personal and home care products) add to the body’s toxic load, making the whole process of health a holistic and infinitely more complex and holistic process than we appreciate. Taken from DeTox? Or Not to Tox? written by Izabella Natrins (Better Living Press 2018) – a fully referenced guide to understanding the body’s natural detox process, getting off the ‘detox-treadmill’ for ever and to the foods and lifestyle that create a cleaner, leaner and healthier you. See more at www.izabellanatrins.com. With 30 years’ experience in the health space, Izabella Natrins is a holistic nutrition & lifestyle health coach, a certified GAPS Practitioner (Digestive Healing), a nutritional chef, author and speaker. She maintains IzabellaNatrins.Com, a food health and lifestyle education website and coaches women in midlife who want to tackle niggling health issues and those who are struggling with diagnosed and chronic health conditions, helping them to regain energy, vitality and much better health. Probiotics branded ‘useless’: but what’s the truth?